Mint and Fuchsia Series There are 10 products. Pastry and Ice-cream Shops Wear: choose the style and colour with Mint and Fuchsia series. 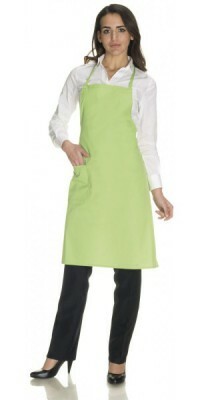 This wear series for Pastry and Ice-cream Shops is made of Soft-Feel Gabardine, a blend and lightweight fabric (50% cot. 50% pol.) that is very cool and comfortable as well as extremely resistant to wear, with bright colours after many washes too. In this category we present two shades: Mint Colour and Fuchsia colour, both with contrasting white details. Three aprons are available: the Desio Apron, a classic unisex apron with bib, the Siria poncho and Cesena Apron, both suitable for female staff. Always dedicated to women, we propose the practical Sabrina Pinafore, very appreciated for the movement comfort and the outstanding wearability and the polished Cake Designer Jacket, perfect for the decoration professionals. In order to complete this wear series for Pastry and Ice-cream Shops, is essential the Agnese Pillbox Hat, available in two coordinated colour. 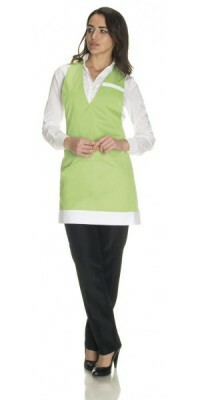 Unisex apron with bib, model Desioone pocket appliedMint coloursize cm. 85 x 70Made of Lightweight Soft-Feel Gabardine, 50% Cot., 50% Pol. Women's Pinafore, model Sabrinato be put on like a ponchoMint with white profilesa big pocket on the bottom and a pocket on the breastImmediately available for delivery: sizes S - LMade of Lightweight Soft-Feel Gabardine, 50% Cot., 50% Pol. Apron with bib, model CesenaMint with white profilesa big pocket on the bottom and a pocket on the breastAdjustable one sizeMade of Lightweight Soft-Feel Gabardine, 50% Cot., 50% Pol. 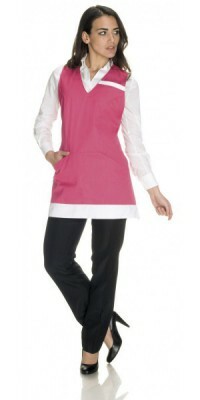 Women's Pinafore, model Sabrinato be put on like a ponchoFuchsia with white profilesa big pocket on the bottom and a pocket on the breastImmediately available for delivery: sizes S - LMade of Lightweight Soft-Feel Gabardine, 50% Cot., 50% Pol. Apron with bib, model CesenaFuchsia with white profilesa big pocket on the bottom and a pocket on the breastAdjustable one sizeMade of Lightweight Soft-Feel Gabardine, 50% Cot., 50% Pol. Cake designer's jacket Fuchsia, with white contrasting profile white pull-out buttons Immediately available for delivery: sizes from S to XL Made of Lightweight Soft-Feel Gabardine, 50% Cot., 50% Pol. Cake designer's jacket White, with fuchsia contrasting profile white pull-out buttons Immediately available for delivery: sizes from S to XL Made of Lightweight Soft-Feel Gabardine, 50% Cot., 50% Pol.